While in Hong Kong, Gary took us to a fantastic 1960s style restaurant called Sunning. The menu was full of classics including Baked Alaska. This being only the second time I have had the dessert, I was taken by the over-the-top nature of the dish and decided that when I returned to Bangkok, I would try preparing it. The version prepared at Sunning Restaurant is beautiful, nicely shaped, like something right out of a Betty Crocker cookbook or Better Homes and Gardens magazine. The whole video experience is here – pardon the less-than-stellar audio quality. Baked Alaska is a single layer of cake with ice cream on top – quite a thick layer of it, ideally domed. The whole dessert is then coated with meringue, which provides insulation when the dessert is then placed in a very hot oven for a few minutes to brown the exterior. Instead of the traditional pistachio ice cream, I opted for alternating layers of macadamia nut and mango sherbet. For some contrast, I also added crushed raspberries. The kitchen was quite warm when I was molding the ice cream into a stainless steel bowl, so instead of neat layers, there were gaps, air pockets, and swirls. Unmolding the ice cream from the bowl was a challenge the next day. Lining it with plastic wrap did not help. The most showy versions include setting the dessert alight with some brandy. That was a bit too much to accomplish this first time. The most important thing is that the birthday boy and all the guests enjoyed the dessert. Next time, I will work on improving my technique. This entry was posted in Uncategorized and tagged Alaska, baked, baking, cooking, dessert, food, meringue by christao408. Bookmark the permalink. Great job Chris!! Always loved that, though I’d have stuck with the Pistachio. I actually prefer the mixture you had and even the result. I liked the shape and tinge on the meringue. Great job. Glad you all enjoyed it. The brandy is for show – well maybe a little flavor but I would rather drink the brandy with it lolol. Very impressive, Chris! A stiffer, thicker layer of meringue would make it all the more wonderful, and I wonder if a layer of oil on the bowl would have worked better than the plastic wrap? Quite the show! I have never had Baked Alaska let alone attempted to make it. I’m thinking it would make a wonderful birthday cake for my husband. He is a fan of ice cream. That looks so yummy. I want to try making one now. I like my ice cream rock solid. Hats off to you for a very impressive & delicious cake indeed, can’t wait to see it light up on the next attempt Your little assistant is so cute! You have to do a quick intro in the video! Suggestions: Try spraying the bowl with cooking spray before putting plastic wrap in, then ice cream. Or place warm towel over bowl for a very short time to loosen ice cream around the edges. Perhaps a ceramic bowl would work better than stainless steel. Regardless, it looks delicious. @jandsschultz – Actually, I did spray the bowl first and had a dickens of a time getting the plastic wrap to line it neatly. Yes, perhaps a ceramic bowl would be better? I actually want to try to make little individual Alaskas using ring molds. huh, impressive. not being a fan of meringues, i wouldn’t make this, but it does look fun to try light it on fire! Mmmm, homemade merengue is delicious. @kunhuo42 – @ElusiveWords – You guys – both pyromaniacs? @secade – Yes, it is. @James2012 – Thanks for the recommendation. @icepearlz – Hey, stranger! Long time no see…@CurryPuffy – Yes, he is quite the inquisitive child… maybe a little too smart for his own good! @Inciteful – Need to find a freezer that is sufficiently cold, because ideally the ice cream would be solid. @Foodhog – Thanks for the recommendation! 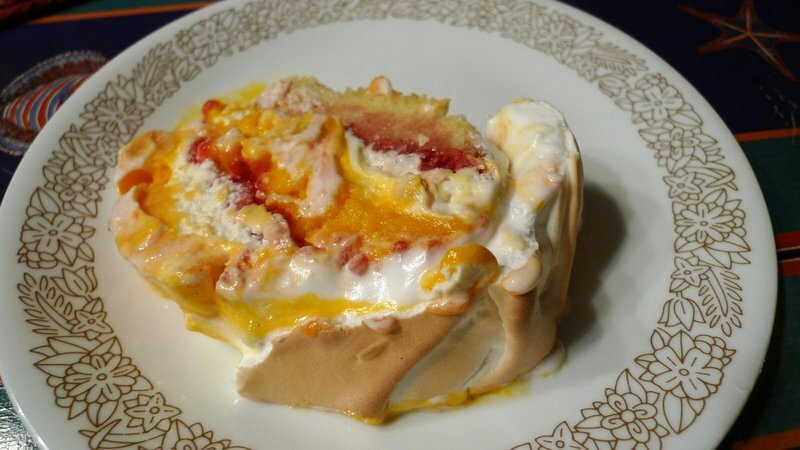 @murisopsis – You should try it… basically just an ice cream cake with meringue instead of frosting. @Grannys_Place – Thanks for the recommendation. Glad you enjoyed it. @slmret – Actually, I sprayed the bowl with oil before lining with plastic wrap… so it should have worked better. @SherryAngeLMysteriez – Thanks for the recommendation. Next time, I’ll try setting it on fire. @Fatcat723 – Brandy on the side for you, then? Noted…@Toro69 – If only I could find pistachio ice cream here! oh my. that looks soooo much better than what we had at sunning restaurant. and i bet taste better too! @rudyhou – Oh, that’s sweet of you to say but I tihnk the chef at Sunning is miles ahead of me! 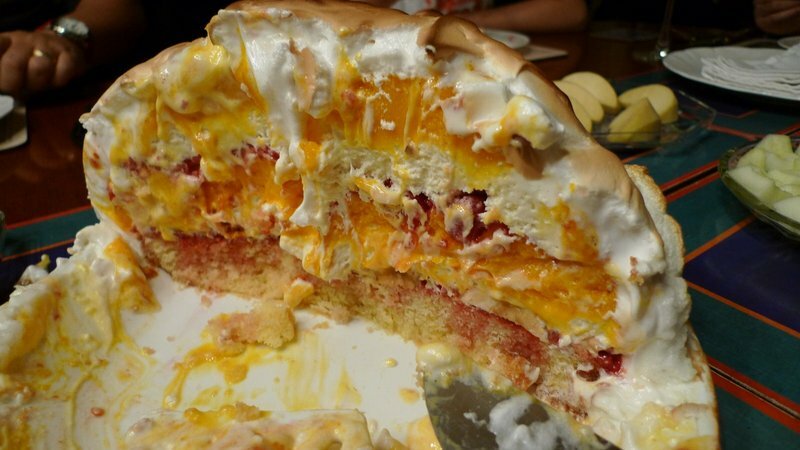 The one and only time I had baked Alaska was about twenty five years ago. I can still feel the taste of it on my tongue. I loved watching the video and I think I may get bold enough to try it out here.Chris, could you have used a cooking spray in the stainless steel bowl before packing it with ice cream or/and dipping the bottom of that bowl in a pan of lukewarm water, for ease of emptying the contents on to the cake? Just wondering. Thank you for the demonstration. Hi! I’m new to your blog, followed a mutual friend’s rec here. 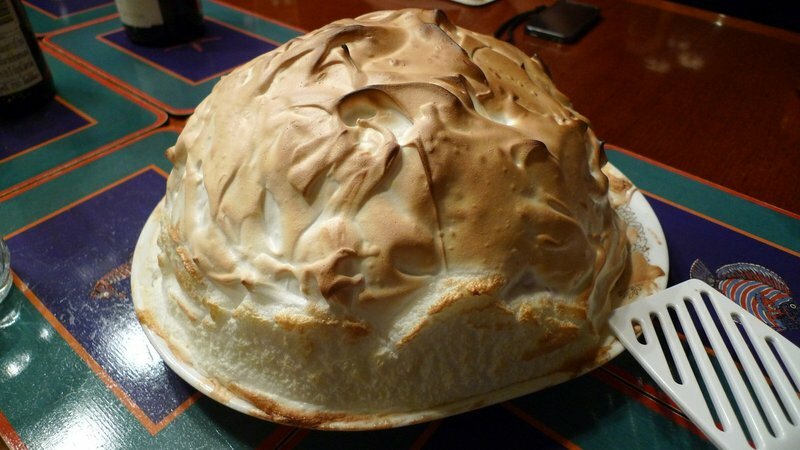 =) Your Baked Alaska looks gorgeous! I’ve been tempted to make an attempt of my own but still need to muster the courage and time (I’m also a bit of a pyrophobe lol! )I saw in your earlier comments that you wanted to find pistachio ice cream! Ben and Jerry’s has an absolutely DELICIOUS pistachio ice cream called “Pistachio Pistachio” (I think). If you live near an area with an Indian or South Asian grocery store, I can almost guarantee that they’ll have a pistachio flavored ice cream, too! @ZSA_MD – Thanks for the recommendation, Dr. Z. I thought about the water idea and it would probably work. I just was worried about making it too soft. Perhaps if I had a freezer that was not overloaded, I could put it back in and quickly solidify it. @syedanoor – Welcome and thanks for your comments. I live in Bangkok, Thailand and haven’t been able to find pistachio ice cream here, even from Ben and Jerry’s. But that’s okay, macadamia nut ice cream is a good alternative flavor!